Having spent a great deal of time building Smallbrook "Emett" locomotives, designing a few of my own, building a diorama (Chipping Clinker Engine Shed) and other things to do with trains, I thought it was time I started to building somewhere to run them. Here's what the stock and buildings look like on the 8' x 4' board. Before I begin to lay the track, I had to work out what automatic coupling system to use. This was quite hard as the Smallbrook Oysterbeach coaches have a high roof overhang and the buffers are quite long. The solution turned out to be simple. I used "Dapol" OO scale NEM coupler pockets and Kadee HO scale #20 NEM extra long couplers. The curves on the layout are 21" radius and the distance between the coaches with the couplers has sufficient distance to prevent roof and buffer lock. 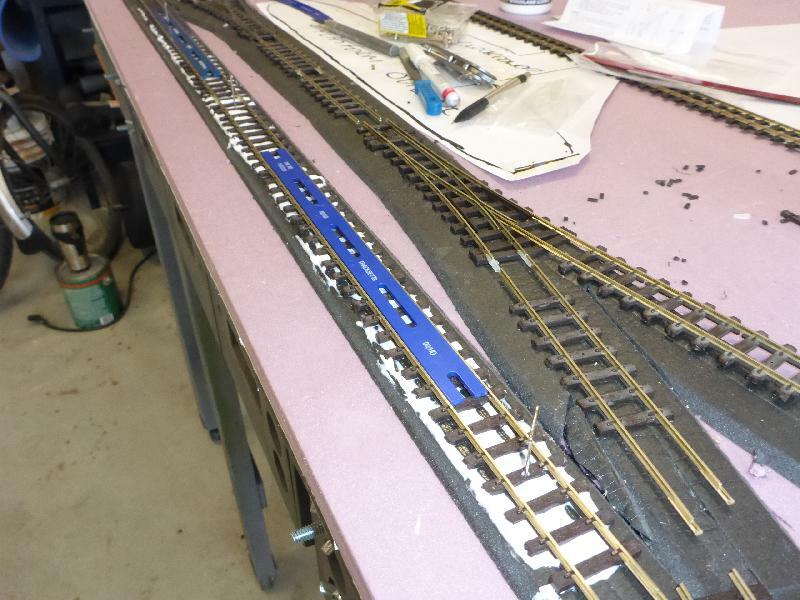 Track laying will begin soon followed by framing for the scenery - the passing loop without the sidings will be concealed and used as a fiddle yard. I think I started in this scale back in 2006 when I purchased my first Smallbrook Nellie from Mike Rayner, so 11 years later the layout has begun.....Huzza !!! Very pretty engine and the car. Keep it up! I didn't spot the deliberate mistake in the title. Much Knattering should read "Gnattering" in honour of Steve Bennet's GN15 (Pepper 7) "Gnat" locomotive. This was the first GN15 locomotive I purchased and I have a collection of Steve's other kits. 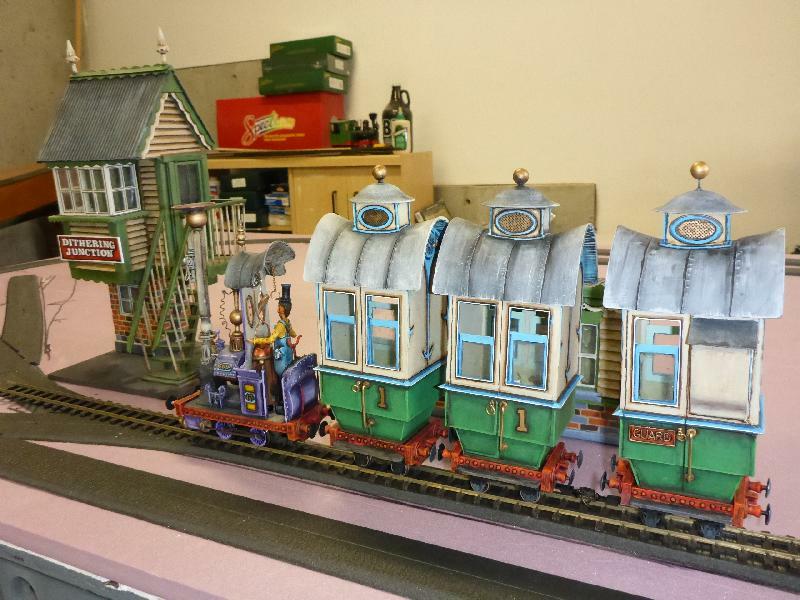 I then purchased a "Nellie" GN15 kit from Mike Rayner of Smallbrook and became addicted to the world of whimsical "Emettesque" and "Heath Robinson" railways. But it all started with a "Gnat" - hence "Gnattering". Happy modelling and to quote Juergen - have fun !! It's been a while - nice to see that you're still inspiring us! One thing to bear in mind with the layout is to make sure you have some form of fence/wall around the edge in case the trains derail - I learned this one the hard way with poor Firestone having to undergo surgery to reattach his arm. Like the others, I'm looking forward to seeing your progress with this. Looking good. It's big for these pages. Stage 1: Track laying, followed by wiring. Nothing moves forward until locomotives run and kadee coupling system functions. Currently I'm unsure whether to fit point motors at an early stage or leave them till later. I like the PECO "Smartswitch" system. I intend to use live frogs on the turnouts - I'm keeping things simple at this time and don't plan to go digital just yet. Stage 2: Scenery framing, and by this I mean scenery/fiddle yard concealment, board edge trim and above board lighting frame. Stage 3: Scenery detailing - installation of ground/hills, followed by buildings/roads etc. This is my first running layout since the very early days of my youth. The most precious commodity is time. I'll place photos and updates on the forum as I move forward. I still get distracted with building Emett style locomotives, which is a pastime I really enjoy. I must balance this creative impulse with the more pressing requirement to see them run. This looks as though it's going to be a brilliant layout Mark and I am looking forward to seeing it develop. Nigel's comment about protecting the ends is well worth bearing in mind. 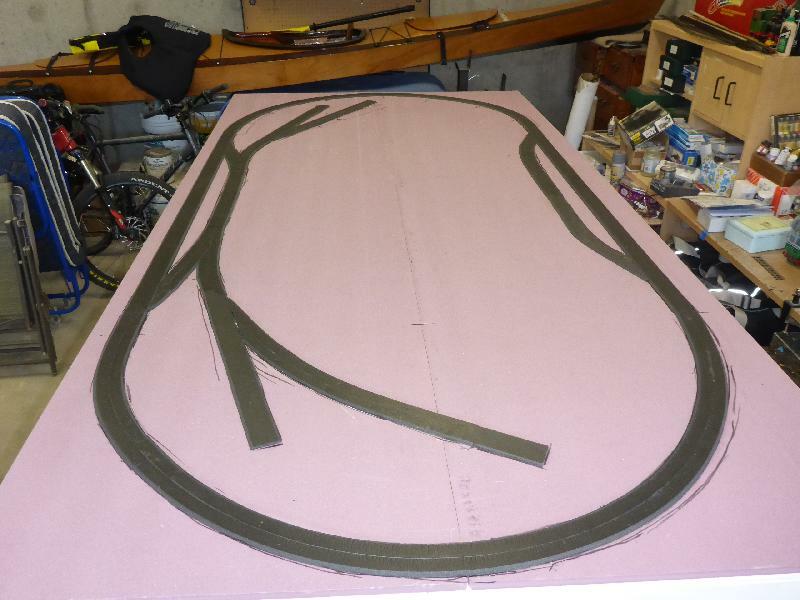 I am going to trying all sorts of things to defend my trains on the end curves on my similar sized layout (well 7' 6" x 3' 3") "Longstone", which I will also take to exhibitions and will be vulnerable to "little hands" too. I may possibly have to use low perspex screens. Best of luck with your modelling. On my classic train set layout ( http://www.island-publishing.co.uk/dublo2.htm ) the Perspex screens I added at the front worked well to stop derails hitting the floor, small hands and my own flapping jacket! Another tip passed on, although the idea isn't mine as I got it IIRC from seeing it on one of Gordon Gravett's layouts, is flexible barriers (sproingers?). Use one of the cone springy door stops to hold a protruding dowel to hang a rope distanced off but along the layout front. The barrier is safe and flexible, the cone/dowell unscrews for transport. Quick and simple to mount when you find the venue has not organised barrier runs in front of layouts. I used home made free-standing uprights for my end stoppers using scrap pallet bases and a shortened broom handle to allow limited operator access to the front for reloading mailbags in the TPO. Varnished it did the trick at low cost. Another photo for scale purposes, i.e. what will a 1/24th scale GN15 train look like on a 4 X 8 baseboard. Note the Kadee coupling installed with a Dapol NEM mounting bracket between the guards van and passenger coach. A simple solution that avoids roof and buffer lock with the high coaches. (Always late to reply...) Yes, I used those springy door stop & rope "barriers" all around my Whitsend Tramway layout for several years. They do work. Sometimes kids grab them, but as soon as they realise they have nothing to pull on, they just hold them innocently, no damage is done, and they keep them back from the front of the layout to watch it as it should be. Simple, and low-cost. After some time away from the project, track laying has begun in earnest. 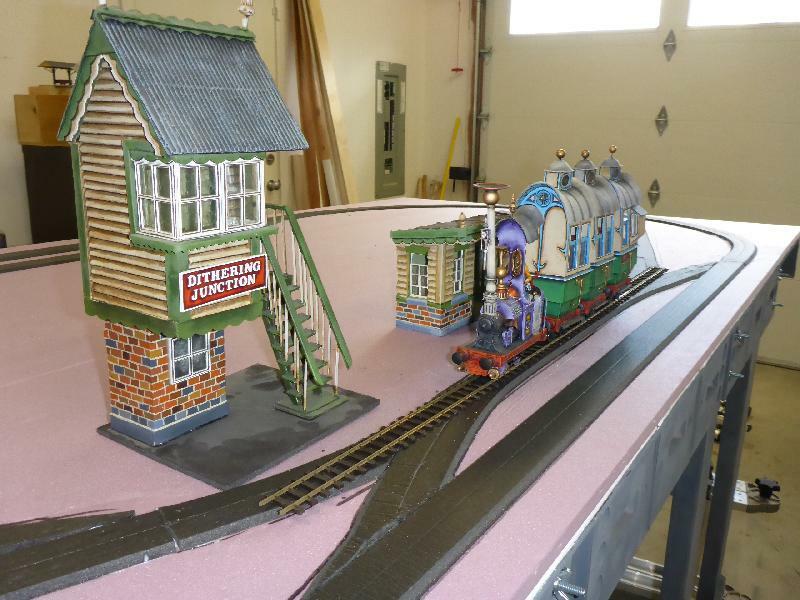 I chose PECO O 16.5 7mm scale narrow gauge track because of its reliability and visual appearance when used with my Emett models (largely from Mike Rayner's Smallbrook Studios). Having used foam insulation and foam track bed, my first nightmare was how to hold 21" radius curves with track pins that may not have too much of a grip in foam products. The solution was simple. I used "Woodland Scenics" foam adhesive and foam nails (large pins with a "T" shaped head) to hold the curve in place, installing them using a "Tracksetta" template. The pins were remove after the adhesive had set (24 hours). 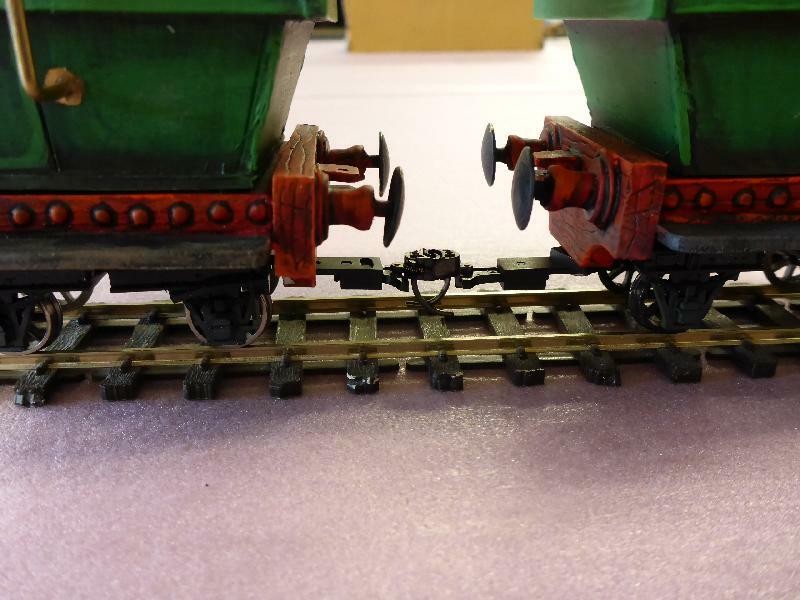 The adhesive dries clear and the appearance will be improved with ballasting. The first photograph shows the system in place with a section of straight track, and the white adhesive can be seen. The track on the right has been cut and is ready for installation at a later date. The second photograph shows the curved section after the adhesive had dried. 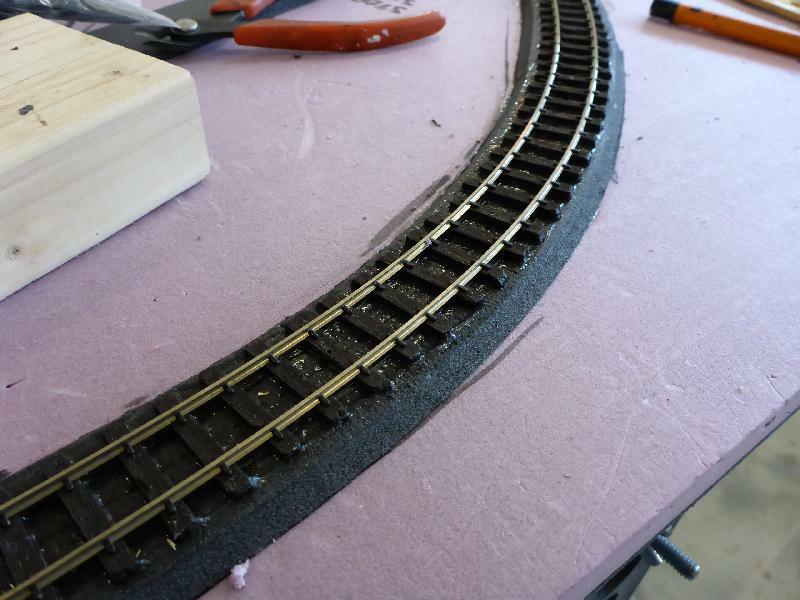 After track laying, wiring will follow, and after testing, the installation of scenic breaks followed by full scenery.